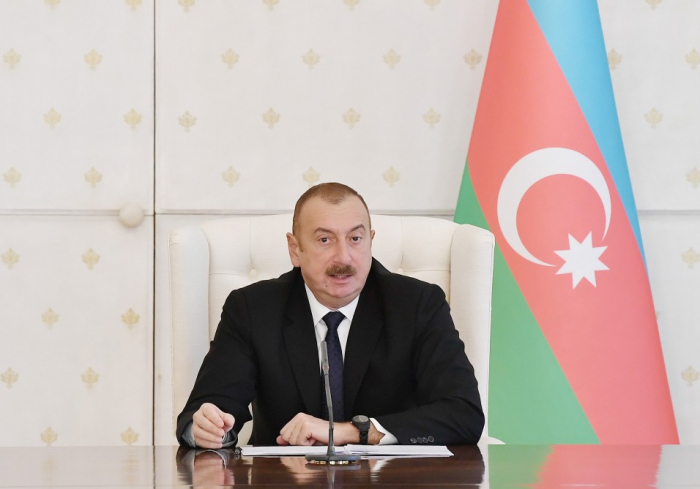 2018 has been successful for our country, despite the negative processes in the world and in the region, Azerbaijan has been developing comprehensively and dynamic", President Aliyev noted at the meeting of the Cabinet of Ministers dedicated to the results of socioeconomic development of 2018 and objectives for the future, AzVision.az reports. The head of state said that last year, the third five-year long program on socio-economic development of the regions ended and the fourth program will be adopted this year. Stressing the high level of reletions with neighboring countries, the president said that the socio-political situation in our country is stable and that the number of countries willing to cooperate with us has increased. The President also spoke about the importance of the Partnership Priorities document signed between the European Union and Azerbaijan and said that this year Azerbaijan will chair the Non-Aligned Movement. 'Azerbaijan will never reconcile itself to occupation of its territories,' president Aliyev noted speaking of the Karabakh conflict between Azerbaijan and Armenia. He also spoke about the great miltary achievements and added that 11 thousand hectares of land had been taken under the control of Azerbaijan as a result of the successful operation in Nakhchivan.